We're a week into August already, and I'm still surprised that July is over. I just seem to be running behind in more ways than one, but fortunately: (1) this blog hop is open until tonight, and (2) this is a no-guilt zone, and writing this post is not merely something to cross off my to-do list, but rather a welcome chance to reflect back on beautiful moments of the past week. 1. I'm thankful for wildlife. We had our first deer sighting last week. John and I were sitting at the dinner table and saw a deer bounding across the mountain. I thought perhaps she was being chased by another creature, but I didn't see a predator. 2. I'm thankful for a nice run last Saturday. John is training for his first marathon; I'm preparing for another half-marathon. On Saturday, we each drove a car. I parked at the mouth of the canyon, then rode with John as he drove us up the canyon. We ran down together (a little over 6 miles), then I got in the car and drove ahead, stopping along the way to offer John water and snacks while he completed a longer run (18+ miles altogether.) Then I drove back up the canyon so John could retrieve the other car. It was a morning well-spent. 3. I'm thankful for running cars. Digital odometers have eliminated much of the anticipation of seeing a car "turn over" the miles, but there is still something satisfying about seeing a row of zeros. Photo: A collage of two photos of an odometer. 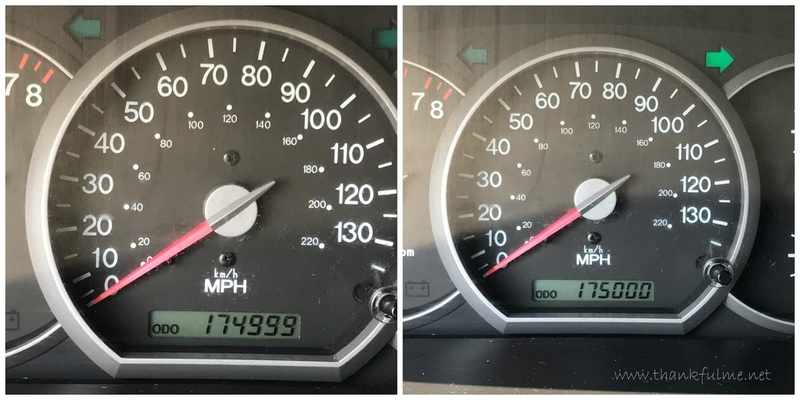 On the left, the odometer reads 174,999, and on the right it reads 175,000. 4. I'm thankful for a Relief Society activity in my new ward, which gave me a chance to visit with women who will, I'm sure, become my friends. 6. I'm thankful for walks with Drexel. Unlike many labs, he's not a bundle of endless energy, but he does seem to enjoy walking with me. Sometimes we go on trails behind our house; other times we go on a nearby paved walking path. 7. I'm thankful for the TToT community. Some of us are "old-timers" here; others have joined just recently, but all are welcome and contribute to this kind corner of the internet. 8. I'm thankful that my youngest daughter has found a more permanent living arrangement. Though she moved out earlier this year, that was a more temporary contract. Yesterday we helped her move into a longer-term place, and we're happy for her. It's easier to relax into being an empty-nester when the kids are more settled. 10. I'm thankful for John. He lets me pick the running pace when we run together, and never complains if I decide to walk for a tenth of a mile. (Lately I've been employing a run a mile or so, walk a tenth strategy.) He asks my input on what projects he should tackle next: "I'm thinking about working on project A or project B. Which would you like me to start today?" But friendship and marriage is more than "What's in it for me?" I'm thankful that John is my best friend and husband because he is who he is and I love him. Though I'm posting this late in the game for this week's link-up, you are always invited and welcome. If you post is done after the link-up closes, another will open on Friday. This month is our TToT reunion month; we'd love to hear from all our friends! What are you thankful for? Kudos to you and John for your training strategy. It sounds like it worked well with the cars. It is fun to see the odometer change to a milestone number. I remember driving around the block to watch it happen. It really did work out well—and much easier than having to run down the canyon, then turn around and run uphill! How funny that I'd forgotten about watching the numbers slowly move up (or was it down?) on the odometer. Running cars are certainly a good thing! So many good things happening in your family! Yeah, John, and yeah you for keeping him hydrating and being there to pick him up at the end of his runs. A wonderful, thoughtful, thankful list. Orange flamingos are new to me, too. Great running strategy, and we do watch for those click-over milestones on the odometer, too.